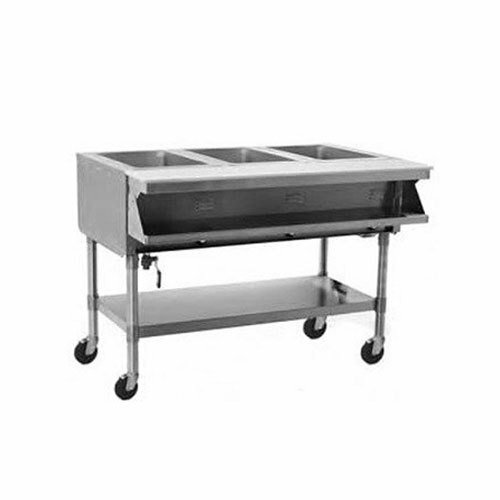 Eagle Group BS2-HT2 Stainless Steel Buffet Shelf with 2 Sneeze Guards for 2 Well Food Tables - 33" x 36"
Thanks to its 4" diameter casters and sealed well design, this Eagle Group SPHT2 two well, sealed well, portable steam table offers a mobile time and money saving serving solution for your cafeteria, buffet, or restaurant kitchen. Made of one-piece, deep drawn 304 stainless steel with fully coved corners and 1" of fiberglass insulation on all sides, the hot food table's 2 sealed wells are specifically designed to prevent cold spots and promote consistent, even warming. 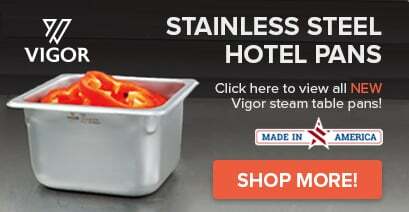 Each well features a 3/4" drain that is attached to a common manifold, which eliminates the need for cumbersome spillage pans and reduces clean up time. A powerful tubular style heating element is secured to the underside of each well. Individual infinite controls offer up to 10 different holding temperature settings. 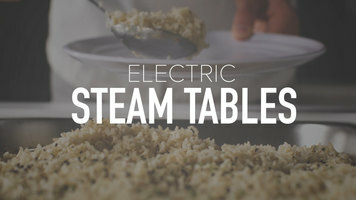 The Eagle Group SPHT2 closed well hot food table also features a removable, 7 3/4" wide full length polycarbonate cutting board which provides ample space for food preparation and plating. This unit comes with a NEMA 15-20P plug.